New Arai Astro IQ helmet! After probably too long with my old faithful Arai Rapide Or matt black helmet, a couple of months ago I got around to getting down to NAPS and getting myself a new helmet. 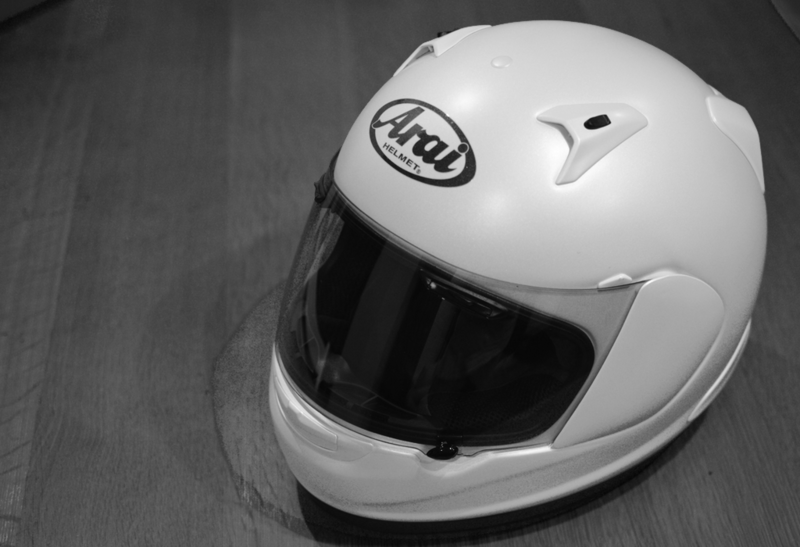 After trying on quite a few, as always, I actually went with another Arai helmet, the Astro IQ in a matt white going by the seductive name of ‘silk white‘. I went for the white as my current bike is black and quite a lot of my gear is, so for the sake of visibility, I’ve gone for the lighter coloured helmet. That said, the one thing to remember about helmets: fit is everything. My fit apparently is XL, due to the size of my cranium or something. This model forms part of Arai’s R75 technology range, making a rounder helmet, which along with the Facial Contour System should make the helmet safer in crashes, and more comfortable in use, including making it easier for emergency services to get the helmet off after a crash. Lot’s of marketing talk, but how does it feel out in use? I have to say that I wasn’t expecting it to be that much different to the old helmet, but after a few hundred kilometres around town, on the expressways and into the mountains, I was really impressed – more comfortable, quieter, and much easier to turn my head in at speed to check behind. Some of this I’m sure is the new design, but some I suspect is how worn and settled my old helmet was, and whilst it’d never had an impact, the padding especially had settled a bit. The IQ does indeed feel rounder, and lighter too, and I take it as a great sign that I began to wonder why I hadn’t bought a new helmet sooner. The ventilation is impressive, with a good selection of vents made of solid slides and switchers, which are broadly adjustable with your bike gloves on; this is definitely an improvement over the old helmet – the ventilation wasn’t bad, but it couldn’t be practically adjusted with gloves on. So that’s it, I’m very pleased with the new helmet, and the only real downside is that huge Arai logo on the front. Nexus 7 as a laptop?